Anomalous left coronary artery from the pulmonary artery (ALCAPA) is a heart defect. The left coronary artery (LCA), which carries blood to the heart muscle, begins from the pulmonary artery instead of the aorta. ALCAPA is present at birth (congenital). ALCAPA is a problem that occurs when the baby’s heart is developing early in the pregnancy. The developing blood vessel to the heart muscle does not attach correctly. In the normal heart, the LCA originates from the aorta. It supplies oxygen-rich blood to the heart muscle on the left side of the heart as well as the mitral valve (the heart valve between the upper and lower chambers of the heart on the left side). The aorta is the major blood vessel that takes oxygen-rich blood from the heart to the rest of the body. In children with ALCAPA, the LCA originates from the pulmonary artery. The pulmonary artery is the major blood vessel that takes oxygen-poor blood from the heart to the lungs to pick up oxygen. When this defect occurs, blood that is lacking in oxygen is carried to the heart muscle on the left side of the heart. Therefore, the heart muscle does not get enough oxygen. The tissue begins to die due to lack of oxygen. This can cause a heart attack in the baby. A condition known as "coronary steal" further damages the heart in babies with ALCAPA. The low blood pressure in the pulmonary artery causes blood from the abnormally connected LCA to flow back toward the pulmonary artery instead of toward the heart muscle. This results in less blood and oxygen to the heart muscle. This problem can also lead to a heart attack in a baby. Coronary steal develops over time in babies with ALCAPA if the condition is not treated early. Symptoms can appear within the first 2 months of the baby’s life. Typically, ALCAPA is diagnosed during infancy. In rare cases, this defect is not diagnosed until someone is a child or adult. Surgery is needed to correct ALCAPA. Only one surgery is needed in most cases. However, the surgery will depend on the baby’s condition and the size of the involved blood vessels. If the heart muscle supporting the mitral valve is seriously damaged from decreased oxygen, the baby may also need surgery to repair or replace the valve. The mitral valve controls blood flow between the chambers on the left side of the heart. A heart transplant can be done in case the baby’s heart is severely damaged due to lack of oxygen. Without treatment, most babies do not survive their first year. Children who do survive without treatment may have serious heart problems. Babies with this problem who aren’t treated could die suddenly during the following years. With early treatment such as surgery, most babies do well and can expect a normal life. Routine follow-ups with a heart specialist (cardiologist) will be needed. Brothers JA, Frommelt MA, Jaquiss RDB, Myerburg RJ, Fraser CD Jr, Tweddell JS. Expert consensus guidelines: anomalous aortic origin of a coronary artery. J Thorac Cardiovasc Surg. 2017;153(6):1440-1457. PMID: 28274557 www.ncbi.nlm.nih.gov/pubmed/28274557. Brothers JA, Gaynor JW. Surgery for congenital anomalies of the coronary arteries. In: Sellke FW, del Nido PJ, Swanson SJ, eds. Sabiston and Spencer Surgery of the Chest. 9th ed. Philadelphia, PA: Elsevier; 2016:chap 124. 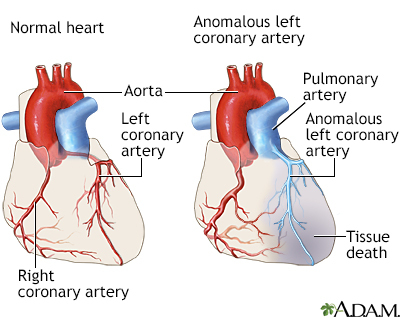 Anomalous left coronary artery is a heart defect in which the left coronary artery, which usually carries blood to a large portion of the heart muscle, does not form correctly. This causes the heart to not receive enough oxygen for it to pump correctly. This heart defect is present at birth and happens during the development of the baby's heart and vessels.